Developer Ubisoft Montreal has performed wonders in terms of providing a new and fresh gameplay experience which is still recognisably and fundamentally a Far Cry game. What better place to hide from the dreariness and venality of the modern world, with its Brexit debates, out-of-touch politicians, bearded hipsters, fat-cat bankers and property developers, than the altogether less complicated and unsullied Stone Age? In the modern games industry, once a publisher has a hit and follows it up with a successful sequel, all thoughts of risk and reward go out of the window. For that marks the point at which a new "franchise" is established, and we all know what those are like: annual cash-cows that would never dare to alienate any fans by trying anything controversial. But discerning gamers get bored of unimaginative franchises, and a lukewarm reception for Far Cry 4 – fuelled by a sense that it was too similar to Far Cry 3, despite both being bloomin' brilliant games – must have triggered some serious thought at Ubisoft. So the French publisher deserves enormous credit for rebooting the franchise with the brave curveball that is Far Cry Primal. Far Cry games have always been open-world first-person shooters, right? Well, not any more. Since Primal is set in 10,000BC, in the Stone Age, there's no way that it could have been a shooter. The setting has dictated that guns, vehicles, explosives and gadgets are absent – along with recognisable language. But the curious – and perhaps most impressive – aspect of Primal is that it feels unmistakably like a Far Cry game. 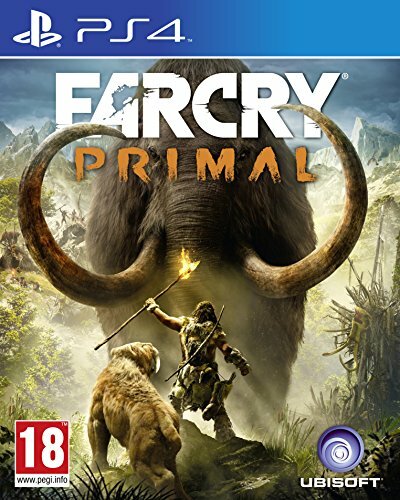 The new setting proves utterly compelling – those who derived the most joy from Far Cry games by simply bimbling around its map, exploring and hunting in a deliciously aimless manner will absolutely love Primal. Its game-world is fabulous to behold and utterly believable, and it's packed with obscure places to explore and resources to sniff out. Which should not imply that it falls down story-wise: Primal has a fully realised story which is way better than you imagine it would be, given that it is enacted by some pretty primitive humans. Ubisoft invented an entire language for the game, which is augmented by the characters' body-language, so you have to pay attention to the subtitles in the cut-scenes. The story does feel a bit disjointed, though, in comparison with past Far Cry games – and there's no epic villain to the level of Pagan Min from Far Cry 4 (one of the best badguys of recent video game times). In Primal you play Takkar, a member of the Wenja tribe, who loses his hunting partners to a sabretooth tiger-attack, and stumbles upon a Wenja woman called Sayla, who introduces him to a nicely appointed cave which is in the perfect position at which to establish a village. However, the nearby Udam tribe – who are strong and particularly savage – must be beaten first. Sayla has heard talk of other Wenja with specific skills – one a shaman, another a hunter, a third a fighter and a fourth a "thinker" (who turns out to be comic relief, since he is a total idiot). So, as you set out to find them, and encounter random events, side-missions and settlements which you can claim for the Wenja, you acquire quite an arsenal and an impressive set of skills. Far Cry Primal review: The Taming of the... lion? Chief among which is the ability to tame wild animals, which then fight at your side. The shaman is the key to your awakening as a beast-master – and the scenes in which he features are very reminiscent of the psychedelic mushroom-tripping ones from Far Cry 3. The shaman makes you drink disgusting liquid from an animal skull, which induces visions – in the first, you chase an owl, before taming it. Later visions are completely outré – in one, you have to shoot the moon with flaming arrows until it shatters. Your first animal compatriot, the owl, you can fly around as a sort of airborne scout, seeing through its eyes, tagging enemies and even attacking them when you level it up. Which is pretty cool but, in practice, the owl proves to be the most superfluous element of your arsenal. Far more useful are the beasts you can tame before pointing them at enemies which they will then attack. You start off with a wolf, but as you level-up, you acquire the ability to tame the likes of bears and sabretooth tigers, and even to ride woolly mammoths. It's vital to tame the right animal: when you reach the harder story missions, in which you're pretty much taking on whole villages full of savage fighters single-handed, you need a beast which is both durable and has a fearsome attack. It's a good idea to do the Bloodfang missions, in which you hunt particularly fearsome examples of breeds such as a sabretooth tiger and a great bear. You then get to spawn Bloodfangs which pack an extra punch. The weaponry in Far Cry Primal may be primitive, but it's pretty effective, especially since everything can be upgraded. You get a variety of both single and double-handed clubs, plus various bows, spears and a sling. There are even grenades of a sort: bags of bees which keep enemies occupied while you bash them. And you can chuck stone shards which, when upgraded, can send enemies berserk so they attack each other. There's one gadget which turns out to be a key item: a grapple. One feature of Primal is the way in which, after playing it for a while, you learn to read the terrain, which is cold and mountainous in the north, where the Udam tribe live, and more foresty in the south, where you find the Izila. You can only grapple to designated points, but the grapple helps you move across mountainous terrain in a much more direct manner. On-the-fly crafting is also a key element of the bigger battles, and it's really handy to unlock the skill which lets you heal yourself while running. The two tribes you fight are also interesting. The Udam, frankly, are pretty Neanderthal – they hunt mammoth for flesh, which distresses the vegetarian Wenja. But you can identify more with the Izila, who are slimmer in build, paint themselves blue and have mastered fire. They are pretty hostile, but more sophisticated than the Udam. One possible criticism of Far Cry Primal is that it lacks good baddies, which its predecessors featured – Far Cry 4's Pagan Min would have graced a Hollywood film. Batari, leader of the Izila, is pretty great in Primal though: she's surprisingly attractive for a half-crazed savage, but Takkar only encounters her occasionally, and there's no sense of an arch-villain who you must take down, which is a break from previous iterations of Far Cry. But if you can cope with that, you will find Far Cry Primal to be a real treat. Simply immersing yourself in its Stone Age world – and fighting for the survival of both yourself and your tribe – proves to be an intensely enjoyable experience, perhaps because despite the alien nature of the setting, it rings startlingly true.